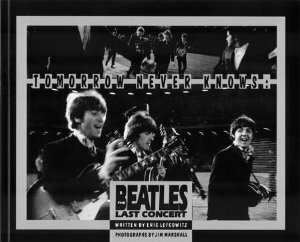 Beatles' Concert © Jim Marshall from The Beatles "Tomorrow Never Knows"
The Beatles Candlestick Park show wasn't just another concert. It was The Beatles last concert. But only the foursome and a few close insiders knew it. The brief 33-minute appearance didn't break any attendance records. But it was the largest concert yet in San Francisco. And it fell just short of the combined attendance of the Cow Palace's two 1965 performances. 25,000 anxious fans waited in the cold that night to watch The Beatles in concert. The foursome walked to the stage surrounded by body guards. The stage was on second base built especially to protect The Fab Four. There was an extraordinary amount of security present that evening. Not even kings, presidents nor Popes receive as much protection. The stage was surrounded by two heavy metal fences. A bullet-proof armored car awaited patiently, behind the stage, motor running, for their "getaway." Just in case. And although this was to be their last concert, only The Beatles themselves and a couple of insiders knew it. This was one year before Sgt. Pepper, and the foursome was simply becoming more and more unable to duplicate on stage what they recorded in the studio. To make matters worse, touring had become dangerous and by the time of the The Beatles San Francisco show they feared for their physical safety, and even their lives. Throughout the brief show they closely scanned the outfield where a small group of boys clung to the fence threatening to jump over-- and make this particular show more than memorable. But to reach the performers they first had about 200 rent-a-cops to deal with. Watch closely as they do jump the fence. Our exclusive Beatles DVD "The Beatles Live In San Francisco" contains all of the Beatles video from San Francisco and is a delightful gift for a Beatles fan. Watch the instigator in his desperate short but memorable stage rush being tackled by three heavy guards after he had already slipped on the field. Seeing The Fabs live in our Beatles video will bring you back to that day when public performing ended. 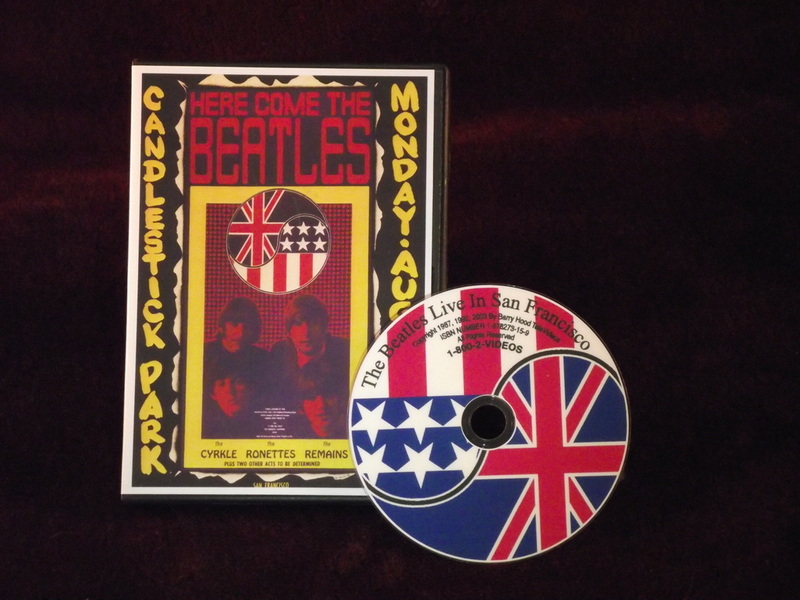 Our Beatles fan gift section contains this Beatles DVD together with other necessary Candlestick fan memorabilia, no fan can be without. Read more about the Candlestick appearance. "The Beatles Live In San Francisco" Beatles DVD. Exclusive Beatles Video! Watch John, Paul, George and Ringo take the stage for their last concert ever! A great gift for a Beatles fan is our Beatles DVD, "The Beatles Live In San Francisco." The entertaining Beatles Last Concert DVD takes you back to August 29, 1966 for what has been called "The Last Hard Day's Night." See the entourage arrive at San Francisco International Airport where they are whisked away by bus to Candlestick Park. This Beatles DVD shows San Francisco's elated Beatles fan's welcome then the foursome were quickly slipped behind iron gates to a party below the box seats at Candlestick. The entire show was over before most of the audience realized it. The Beatles part was a mere 33-minutes, after which they disappeared in an armored car which had been waiting stage-side, with motor running. Much of what we have to remember that Candlestick Park performance by is due to the expertise of world-renown rock photographer Jim Marshall, (February 3, 1936–March 24, 2010.) Surprisingly, this Final Beatles concert was Marshall's first encounter with the band. Marshall spent almost every moment of that day, August 29, 1966 with the group, photographing their San Francisco trip. From their airport arrival to a pre-show party in The San Francisco Giant's locker room. From their march to the stage on second base, to the final Beatles performance. 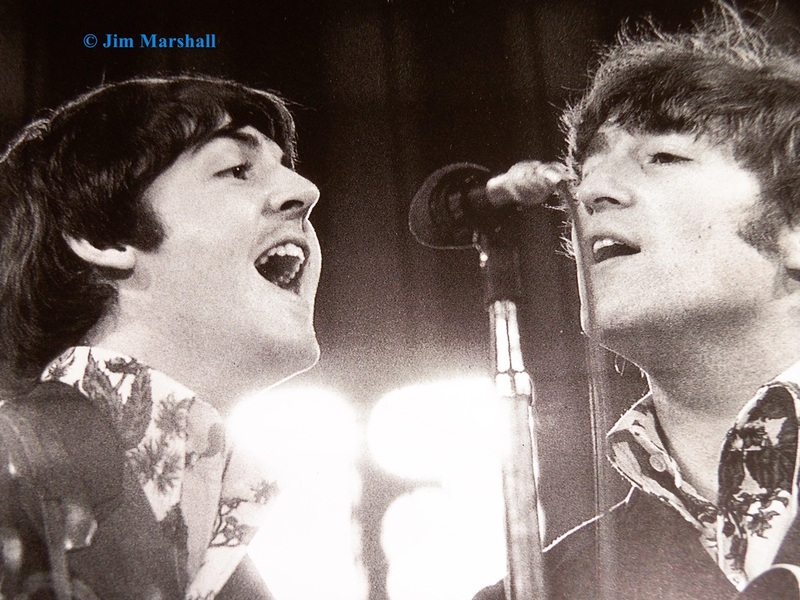 Thanks to Jim Marshall, generations to come will appreciate The Beatles in their last concert as only Jim Marshall could photograph them in living black and white. Many of Marshall's photographs in this exclusive 104-page glossy photo book have never been released elsewhere. Most were previously unreleased prior to the printing of this book. TeleVideos has purchased a small quantity of the rare remaining books in this final printing. Together with our Beatles DVDs, our original Beatles San Francisco gift packages are a rare gift for a Beatles fan. Some are still available with autographs of both author Eric Lefcowitz and Jim Marshall. Some are available with author Lefcowitz's autograph only. Read more.